Once, I spent the day taking care of a friend who was seriously injured after a spill on black ice; he forgot about Valentine’s Day (and a lot of things in his viced-up state), so I did as well. And I loved it. There is, of course, one thing that keeps me from knocking the holiday. I’m sure you know where this is going. Valentine’s Day/Singles Awareness Day/F-ing Hallmark Holiday — whatever you want to call it — is a free pass to buy, make and consume copious amounts of chocolate. People associate fun-sized bars and confection-coated morsels — things that don’t woo me one bit — with the other sweet holiday. But chocolate bonbons, mendiants, caramels, et hoc genus omnes take the stage on February 14th. You can be sure I’ve already ordered bars from Liddabit Sweets. And I’ll also be making these truffles. 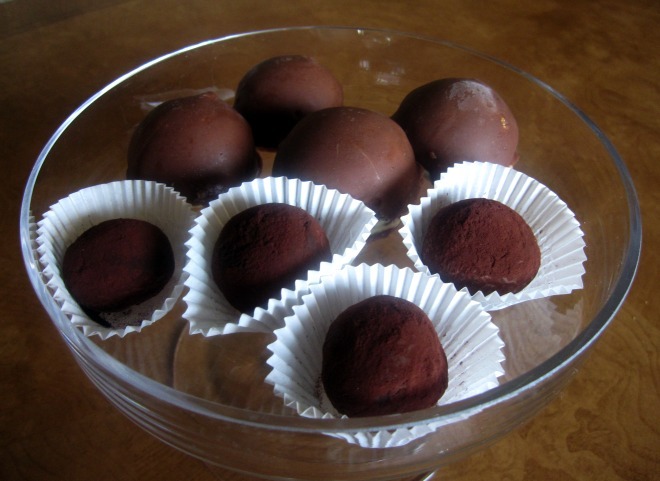 Let us start with traditional chocolate truffles. Everyone loves them, but they’re stupid-simple to make. Classic, dark ganache is scooped out, shaped irregularly and rolled in pure cocoa powder. I like adding butter to truffles; it smoothes them out to ensure a silky texture and no hints of graininess after setting. Just tweak your recipe for the yield you want to make sure the ratio of the weight of chocolate to that of the cream + butter is 1 to 1. When it comes to truffles, darker is better. I prefer my truffles without adornment other than the earthy cocoa powder, but unsweetened, desiccated coconut and chopped nuts are beautiful additions. I made these as part of my Christmas after-dinner treats and thought it would be adorable to pair them with David Lebovitz’s Tartufi (ice cream truffles), plating the shiny brown mounds side by side so they were barely distinguishable. For the holiday, I used my eggnog ice cream for the filling and milk chocolate for the coating since my grandparents do not like dark (or anything for that matter), but the possibilities are, quite literally, endless. I’m eager to try them with my favorite burnt sugar ice cream. The coating is smooth and doesn’t crack under the grasp of your teeth. And if you work quickly when dipping the frozen balls into the chocolate mixture, they’ll look as perfect as they taste. I got the recipe from The Perfect Scoop, but you can find it on Serious Eats. Happy Valentine’s Day to you and yours. Or just you. That’s cool too. I hope it passes in a gluttonous oblivion. Place the chocolate in a heatproof bowl. In a small saucepan, combine the cream and corn syrup and heat to just under a boil. Pour the hot cream over the chocolate and let it sit for a minute. Being careful to incorporate as little air as possible, stir with a rubber spatula in a circular motion until the chocolate melts. Add the butter and stir until it is incorporated. Let the mixture firm up in a cool place until scoopable (the amount of time for the mixture to become firm depends on how cool the room is). Alternatively, you can place the mixture in the refrigerator to speed up the process. Line a sheet pan with parchment paper. Using a small ice cream scoop or a measuring spoon, scoop out 1-inch balls and place on the baking sheet. Transfer balls to the refrigerator to harden slightly, about 20 minutes. 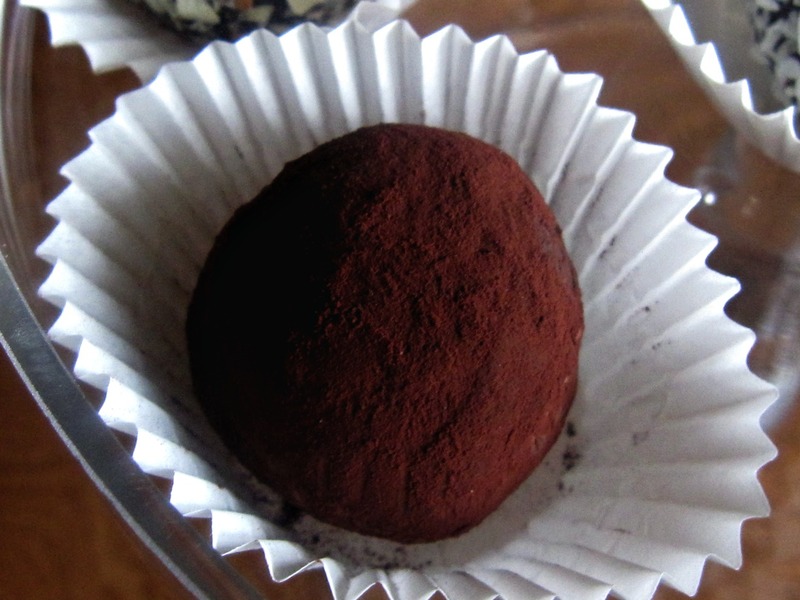 Remove the baking sheet from the refrigerator, dust your hands with cocoa powder (to prevent sticking) and roll each piece between your palms into an irregularly shaped truffle (or a perfect sphere if you like them less mushroom-y). Once the truffles are shaped, place the cocoa powder (or other toppings) in a small pile on a dessert-sized plate and roll each truffle in the cocoa coating evenly. 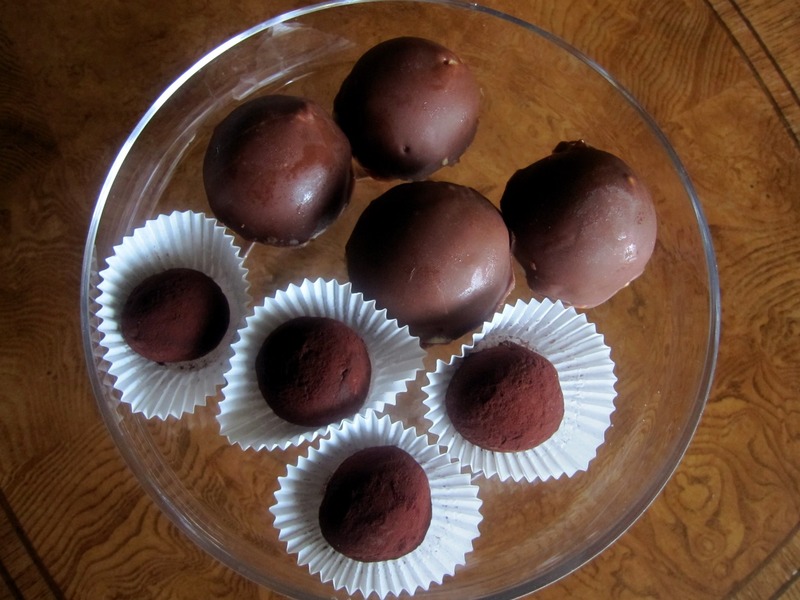 Place the truffles back in the refrigerator to get firm before placing in candy papers (if using). The truffles will keep in an airtight container in the refrigerator for about 2 weeks. Yum! I just made a batch of truffles, too. They are dangerous. And I agree, I love Valentine’s for the chocolate only. These are beautiful. I’ve always been a holiday follower too. I used to throw sickeningly pink parties on V-day — single or not. Nowadays, I whip up an elegant dinner complete with a rich, chocolate dessert. It’s not even 7am here and I would like chocolate now. Thank you. 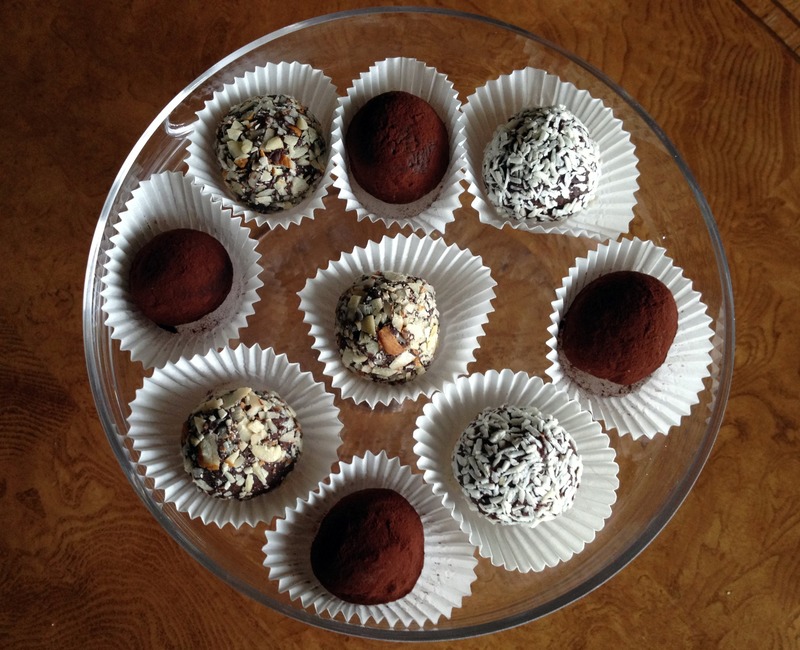 I’ve made truffles twice, once with my very industrious friend and once last year at a class. Yours look fabulous. These look superb! ^^ I’ve always had a special place in my heart (read; stomach) for the cocoa powder covered ones. Gorgeous truffles! I obviously have a sweet spot in my heart (and tummy) for anything chocolate and deep, dark, silken chocolate truffles are one of my favorite treats!